We’ve tried a ridiculous number of face washes marketed toward men this year, and we’re feeling very clean and ready to shout out some favorites. Some of our picks happen to also exfoliate, and we’ve noted many times that you’re probably exfoliating too much/often, and not moisturizing enough. Be sure to strike a balance when stocking up. Oars + Alps’ Solid Face Wash might be my single favorite toiletry of the year. With an activated charcoal base, this face wash deep cleans and exfoliates at the same time, while also doing a fantastic job of beard ablution. The form factor won’t get your face any cleaner, but it’s spill proof and pretty cool to boot. Also, alpine caribou moss. 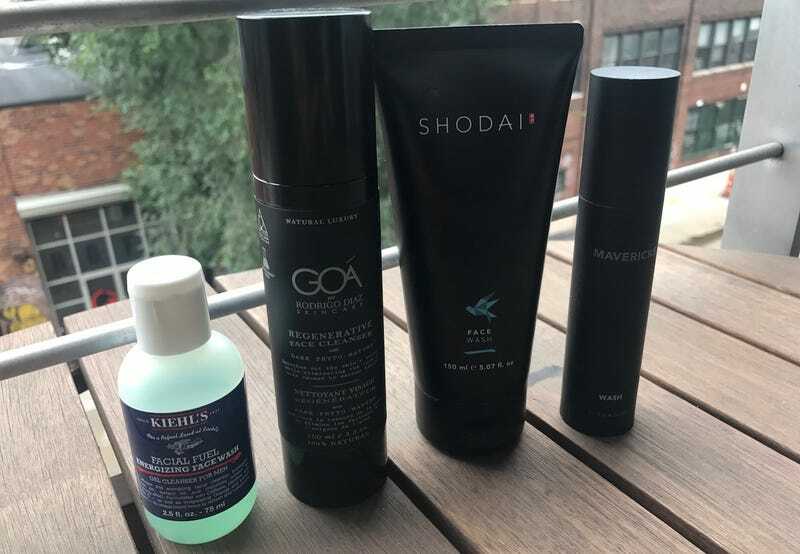 Mavericks is my favorite complete skincare system, with a wash, exfoliant, moisturizer, and shaving cream that all place highly in our rankings. Their face wash is simple and minty, and mild enough to be used multiple times a day. We’re not quite sure if GOA is doing rocket science or blood magic, but this dark phyto-matter sure does feel good on our face. GOA’s offering is billed as a cleanser rather than a wash, and their entire lineup has an anti-aging focus, with ingredients to reduce issues like age lines and pore size. $34/3.4 oz., with the option to save by subscribing. Like the Oars + Alps above, LUSH’s Kalamazoo cleans beard and face at once with aplomb, and softens your beard in the process. Founded in 1995, LUSH feels ancient compared to the rest of the brands on this list, but Kiehl’s has been around since 1851. We’ve used a majority of their products, which all place highly in their respective categories 166 years later, and their face wash is no exception. Kiehl’s Energizing Face Wash is great for both daily cleansing and pre-shave preparation. Packed with caffeine, vitamins, and citrus, it’s the most uplifting wash on our list, and won’t break the bank at $22/8.4 oz.